Don’t burn your bird this Thanksgiving and be the undisputed champion of the holiday by having one of our local talented pitmasters cook for you. They won’t show up to your house but they will give you everything you need to make a memorable meal. It’s time to put an end to Aunt Betty’s Waldorf Salad and whatever that green jello thing is and replace with smoked brisket, turkey, collard greens, mac & cheese, and bourbon pecan pie! Here are a few offerings from local barbecue joints to make your turkey day pretty awesome. If you’re craving Central-TX style BBQ in Pittsburgh you’ll find yourself at SporkPit. I’m cutting it close on getting this to you, as in you need to have it in TODAY, Sunday the 18th! Includes: 13lb. Turkey, 2qt Cran-Pepita Stuffing, 1qt Foie Gras Gravy. Fresh hormone-free turkey from Strip District Meats, brined for two days in rosemary onion brine and then rubbed with smoked paprika, sage, white pepper, black pepper, red pepper, onion powder, garlic powder, and dried mustard. Fully cooked, whole – ready to pick up HOT on Thanksgiving Day! If you have any questions call (412) 404-2128 or order directly from their website. You can also follow SportPit on Facebook, Instagram, and Twitter. Walter’s is the newest BBQ on the block in Pittsburgh and they’re bringing out the big guns for their first Thanksgiving. They give you 2 options depending on the size of your crew. one meat – whole smoked turkey, sliced sweetheart turkey breast, whole sliced brisket (YES!!!) or whole pulled pork. three 1-lb sides – mac n cheese, collard greens, pinto beans, slaw, tater salad, Texas red chili, sweet potato pudding or housemade cranberry sauce. one dessert – warm apple cobbler, bourbon pecan pie, peach cobbler, graham cracker crust key lime pie. If you have a group of 9-12 people the have larger portions and there are a la carte options available. Check out their website for current offerings and prices. Also, make sure you’re following Walter’s on Facebook, Instagram, and Twitter. You may recall Teaspoon and I had a pretty sweet meal there and it’s no surprise they’re rolling out a Thanksgiving package this year. Smoked Turkey ~14-15 lbs along with retained juices during the smoking process. Side Item: Fresh Cranberry Sauce $10 pt. Call (412) 621-9469 for more details. Visit their website and follow them on Facebook, Instagram, and Twitter. Later this week I plan on smoking my first ever turkey on the Pit Barrel Cooker I picked up from the state’s ONLY PBC dealer – Williams Ace Hardware. 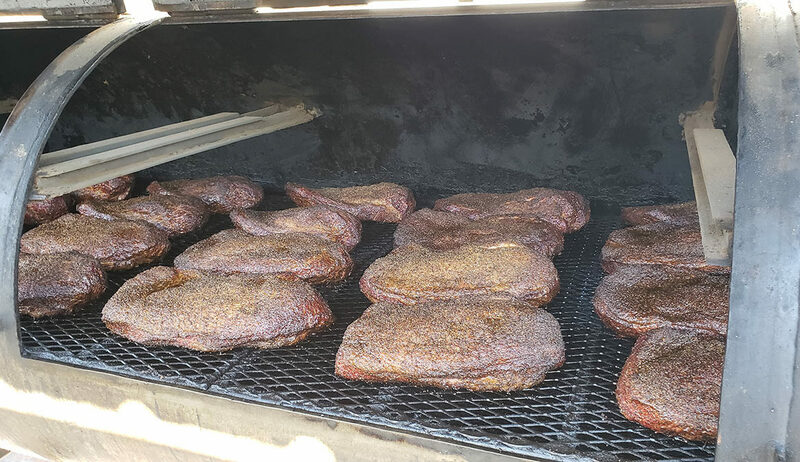 I know better than to try a first-time recipe for a big meal so make sure you’re following Yinz Love BBQ on Facebook, Instagram, and Twitter.